Just because you can do something doesn’t, by any means, mean you should. The Manhattan Project scientists, just prior to setting off the world’s first atomic device at Trinity Test Site, New Mexico, in July of 1945, were taking tongue-in-check bets as to whether the explosion would set the atmosphere alight. We might have taken this as our first clue that our technology, in these latter and less wiser days, very often outpaces our penchant for using it properly. But we didn’t learn, did we? You might argue, fairly enough, that digital interactivity doesn’t play on nearly the same field as runaway nuclear fission. P’haps not. But when they program a Mona Lisa clone to smile or frown at us, to follow us with her creepy, creepy eyes, and to generally break free from her Renaissance two-dimensional plane and to run rampant in the uncanny one right next door to ours…then that’s a clear sign that someone has gotten too weird and uppity with their tech toys. Time to take them away. Signore da Vinci knew what he was doing when he painted this particular inscrutable lady. He used precisely the number of brush-strokes required to bring her to life, or rather to consign her to the ages. The Mona Lisa is complete. Digital touch-ups and necrophilic animation are not required, requested, or invited. 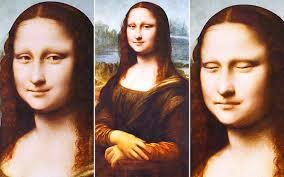 This entry was posted in New Post and tagged digital vandalism, leonardo da vinci, Mona Lisa, No thank you, Nope. Bookmark the permalink.